Stirling is one of those regions central Scotland specialises in. it provides a taste of both lowlands and Highlands; has a staggering share of landmark battlegrounds; is peppered with castles and tales of legendary figures; and contains a slice of natural beauty that will literally leave you gasping. And all that packed cheek by jowl into such a small and delightful area. The capital, also named Stirling, controlled the main route into the Highlands and its strategic location meant it was the stage for some of Scotland’s crucial battles of independence against the repressive English. The region was home to Rob Roy, and the legendary exploits of this champion of the poor sill echo around the southern border of the Highlands. The region has lured walkers and climbers since Victorian times, and the forests and wildlife in this unique environment are protected as part of the Loch Lomond & the Trossachs National Park. Stirling lies at one of Scotland’s most strategic sites and has been at the heart of many conflicts. There’s a hustle and bustle on the streets and footpaths during the day, but at night it all disappears and a twilight walk of the old town can be magical. In the right light and away from the buss of the centre, there’s something a bit fairy-tale-like about Stirling. For visitors the city rivals Edinburgh for historical attractions and the atmosphere of its old town. Replete with winding cobblestone streets, the old town clings to the slopes beneath the castle and the fascinating remnants divulge tales of Stirling’s historical development, stretching over a 500 year period. Another parallel with Edinburgh is the magnificent castle, perched high on a rocky outcrop gazing over the city. Hold Stirling and you control the whole country. This simple strategy has ensured that a castle has existed here since prehistoric times. The superb views it commands mean you cannot help but drawing parallels with Edinburgh Castle – but Stirling is better. Location, architecture and historical significance combine to make it one of the grandest of all Scottish castles. There has been a fortress of some kind here for several thousand years, but the current building dates from the late 14th to the 16th century, when it was a residence of the Stuart monarchs. The Great Hall and Gatehouse were built by James IV; observe the hammer-beam roof and huge fireplaces in the largest medieval hall in Scotland and the result of 35 years’ worth of restoration. The spectacular palace was constructed in the region of James V (1513-42); however, the Royal Lodgings may be temporarily closed to visitors as they are part of the last phase of the castle’s massive restoration project. James VI (r 1567-1625) remodelled the Chapel Royal and was he last king of Scots to live here. In the King’s Old Building is the museum of the Argyll & Sutherland Highlanders, which traces the history of this famous regiment from 1794 to the present day. It has a great collection of ornately decorated dirks (daggers). 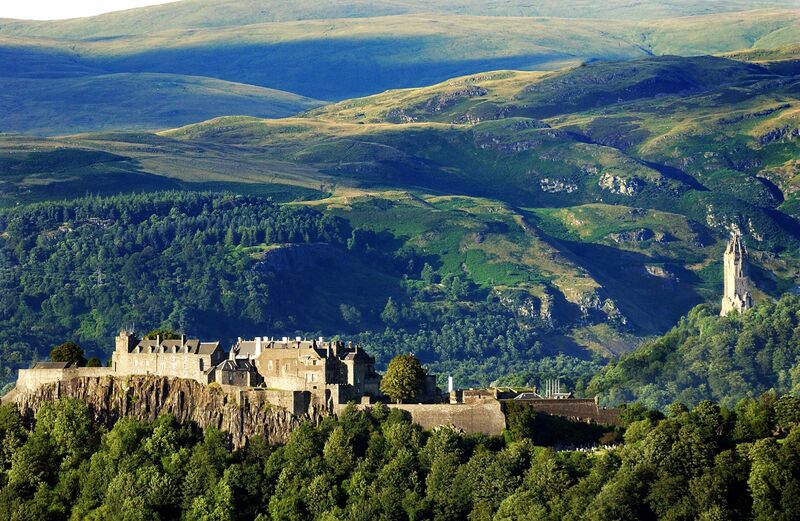 Stirling and its spectacular castle are a must see attraction on your tours of Scotland.